Here's a tricky scenario: What do you do if you are a super lazy person and happen to find yourself out of the house, maybe attending a concert or a street festival, and you feel a twinge of hunger or a bit of dryness in your throat? Sure, you could walk around and find someplace to buy a candy bar or a soda, like some ancient hunter-gather seeking out sustenance in the savanna. Or, you could embrace the future and hail a vending machine with an app on your phone, then sit back and wait as your calories come to you. A Chinese company is working on filling this massive white space of consumer demand, revving up to roll out a pilot project of self-driving vending machines in the U.S. in early 2019. PerceptIn, a robotics company focused on building machines that see, interpret, learn and take action, calls its robo vending machine the DragonFly Intelligent Advertising Vehicle. The robot is expected to cost around $40,000 and is designed to operate in low-speed scenarios and intended for centralized areas such as convention centers, corporate and educational campuses, amusement parks and malls. The DragonFly vehicle can be hailed by a person using their mobile device or stopped when people see it rolling by. 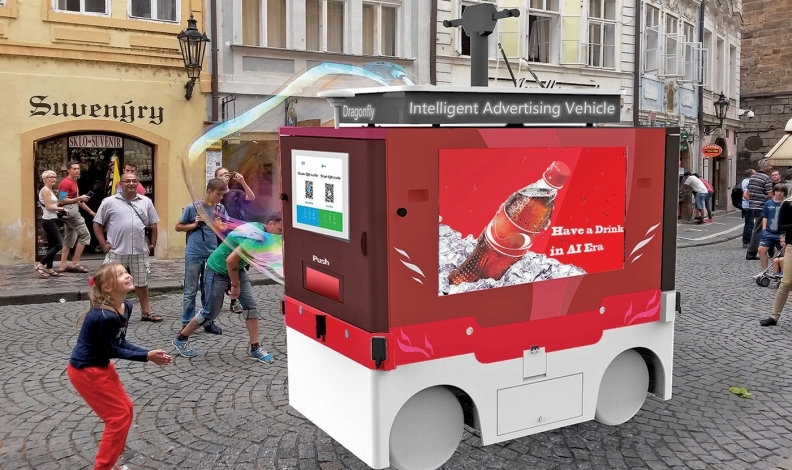 The vending machine also will capture data about how consumers engage with available products, using advanced computer vision and robotics technology. According to PerceptIn, a DragonFly was able to attract more than 1,000 viewers within a 15-minute test run in a commercial complex. The tech company also claims that approximately 58 percent of those viewers spent more than five seconds looking at the advertising displayed on the machine. The self-driving vending machine readies to make its U.S. debut amid a huge surge in outdoor mobile and digital advertising. Out-of-home advertising revenue is expected to hit a high of $7.4 billion this year, according to Magna Global, up 3 percent from last year. "We designed the DragonFly Intelligent Advertising Vehicle as a way to bring intelligence to an area of advertising and retail that had little to none," PerceptIn Chairman Shaoshan Liu said in a press release.